Welcome to Calgary’s most affordable public golf course. Fox Hollow is a unique golf course in Calgary, featuring a full-length 6500 yard well manicured course, short game practice facility, and a heated 50 stall indoor driving range. Through the years, Fox Hollow has become a destination of choice for a wide variety of golfers as it offers a challenge to the most experienced golfer as well as a relaxed environment for beginners to pick up the game. Fox Hollow offers a high level of service and quality at the most competitive rates in the Calgary area. If you haven't visited Fox Hollow in the last number of years you really should stop by and talk to our friendly professional staff. They would be able to assist you with any of your golfing needs. Whether it is a golf lesson, a tee time, a tournament booking or just to browse at all of the great new product for this year we would love to help you. 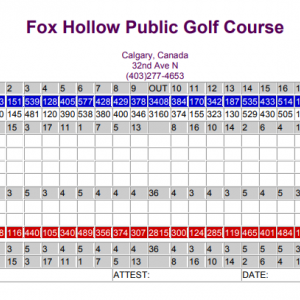 Fox Hollow is just a quick drive from downtown located just off 32nd Avenue N on the west side of Deerfoot Trail so it is easy to escape and enjoy a great day on the course. When you finish your round be sure to stop in at Mulligans Restaurant for dinner, a snack or just an after round cocktail located on the top floor of the clubhouse. We can't wait to see you when you SWING by Calgary's Most Affordable Golf Course!